The human body cannot function properly without a healthy spinal cord. Any damage will interfere with the brain’s ability to deliver messages to the rest of the body, opening the door to the potential for a variety of bodily deficiencies. Depending on the severity of the injuries, victims can suffer numbness and tingling in their arms and/or leg, loss of grip strength and, in the most severe cases, partial or complete paralysis.When these injuries happen in accidents that occur because of another party’s wrongful act or negligence, victims have the right to seek full and fair compensation. At Chambers & Noronha, we have extensive experience handling a wide array of spinal cord injury claims. 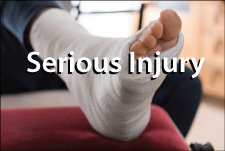 We understand the hardship that these injuries can impose on victims’ lives, and we will work tirelessly to obtain the full measure of compensation available for your claim. Our considerable background resolving a variety of spinal cord injury claims allows us to be much more proactive in our pursuit of fair compensation for our clients. We seek damages for all current and future medical care, including surgeries, rehabilitation, assistive medical equipment and in-home care. Choose a law firm you can trust to go the distance for you. From our attorneys’ office in Santa Ana, we represent clients throughout Orange County and across Southern California. Contact our office to discuss your spinal cord or neck injury case with a lawyer. Call 714-558-1400 or send us an email to schedule a free consultation.